Thought I would share this weeks blue apron dish. we receive and really enjoyed. We trying it. out kinda expensive. The program does save me time on food shopping. I also like the fact the recipes are so easy,but iI don't like always some of the food choices . Wash and dry the fresh produce. Remove the chicken from the refrigerator to bring to room temperature. Peel and thinly slice the onion. Peel the beet and cut it in half lengthwise; very thinly slice the halves. Cut off and discard any fennel stems and fronds (the green, thread-like tops of the plant). Halve the fennel bulb lengthwise; remove and discard the core. Thinly slice the fennel bulb. Pick the parsley leaves off the stems; discard the stems. Cut off and discard peel and pith of the orange; medium dice the orange. In a large bowl, combine the mustard and 3 tablespoons of water. In a medium pan (nonstick, if you have one), combine the sugar, vinegar, onion and ¼ cup of water; season with salt and pepper. Heat to boiling on medium-high. Once boiling, cook 1 to 2 minutes, or until the liquid is slightly reduced in volume. 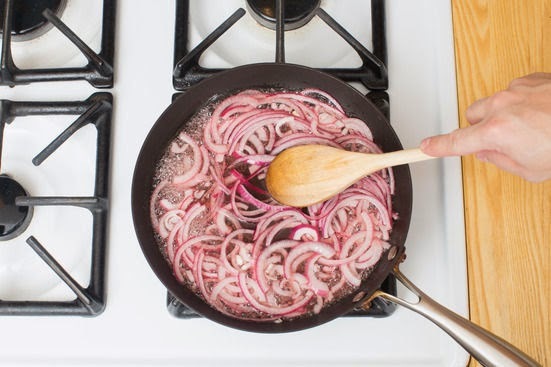 Transfer the onions and pickling liquid to a heatproof bowl and set aside. Carefully rinse and dry the pan. Pat the chicken cutlets dry with paper towels; season with salt and pepper on both sides. Place the matzoh meal in a bowl. Working 1 at a time, coat the seasoned chicken cutlets in the mustard-water mixture (letting the excess drip off), then the matzoh meal (tapping off any excess). Transfer the coated chicken cutlets to a plate. In the same pan used to pickle the onion, heat a thin layer of olive oil on medium-high until hot. Add the coated chicken cutlets and cook 3 to 4 minutes per side, or until golden brown and cooked through. Transfer to a paper towel-lined plate. Reserving 1 tablespoon of the pickling liquid, drain the pickled onions. 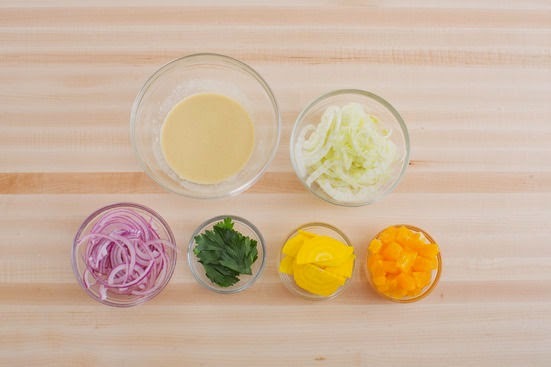 In a large bowl, combine the orange, fennel, beet and drained pickled onion. Add the reserved pickling liquid; drizzle with olive oil and toss to coat. Season with salt and pepper to taste. 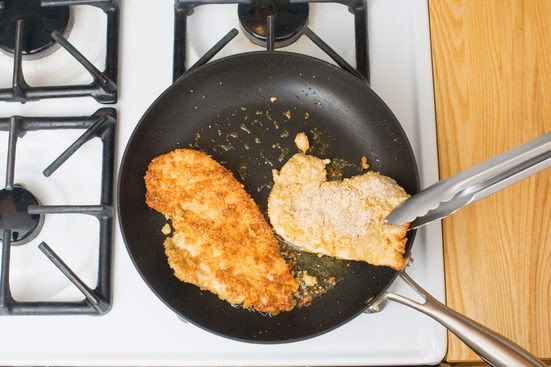 Divide the cooked chicken cutlets between 2 dishes. Top with the salad and garnish with the parsley. Enjoy! 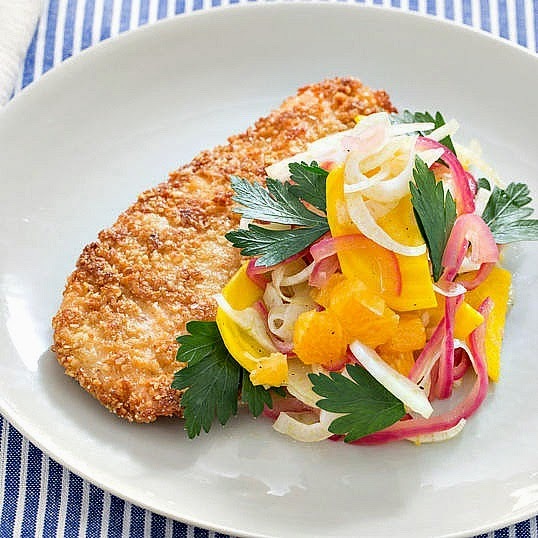 WANT ANOTHER GOODIE FROM BLUE APRON CLICK HERE!